Now a familiar face of the anti-CSG movement and Knitting Nannas Against Gas, Anne had never been an activist before. But when the British-born grandmother heard of the threat of CSG being mined near her home she could not sit idly by. Anne and John Thompson brought 2 sons with them from England in 1962, and had two more in Sydney where they built their Australian life. After seeing John’s father’s farm go bankrupt, they put farming on hold to raise their family in Avalon, where John bluffed his way into a car sales job. 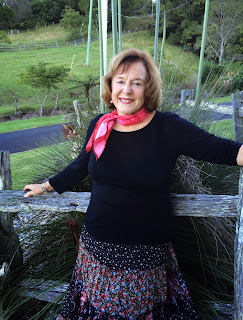 “The green hills up here were so like the countryside we’d left behind”, Anne recalls of the lush pasture that eventually drew them to Bangalow and back to farming in 1982. Plus the lure of the beach was irresistible for their mad-keen surfer sons. The family moved to their current farm in Eltham when the Bangalow bypass was put through their front paddock. In the early 1980s Anne was one of thousands of Australian women embracing aerobics classes. Not fussed about there being no gym in Bangalow, Anne set about creating one. “I said I’d just start my own, and I did.” Anne set routines to music, hired squash courts, and the classes took off. “I had people queuing up. Back to back classes”, she remembers. Soon it became obvious Anne needed a qualification to continue teaching. Jazzercise, a combination of aerobics and dancing, caught her eye one afternoon on TV. “I thought, that’s for me!” She rang the TV station to get in contact with the instructor, went to a class with her and did a workshop. “From then on I was a Jazzercise instructor and it was the flavour of the month.” She has since run classes in most of the halls around this district. “And for most of the women in this district”, she laughs. "'I used to come to your classes’, they say, and I say ‘well why didn’t you keep it up, I’m still doing it’”. Anne seems to possess an innate ability to get straight to the heart of a matter that needs a solution and muster people to action. It’s so unconscious that she hardly notices it, perhaps a trait received from her father who was an army officer. She remembers an instance while living at Avalon when a young girl went missing. A news report about starving cattle, a dustbowl landscape and severe drought in 1994 caught Anne’s attention. Farmers in the west could not afford to buy things that we take for granted, like toothpaste and vegemite. “A new toothbrush was a luxury. And I thought, in Australia, this is happening?” Mentioning her concern to an old farmer, he replied that stock would eat sugar cane tops if they were hungry. To Anne, the solution was obvious, and she approached the cane growers association. “You know, they’re shooting cattle out west, and here you are with all these cane tops you don’t know what to do with”, she remembers. Wheels turned, an article appeared in The Land about it, and Australia Post offered a semi-trailer and a driver from Sydney to help deliver loads of fodder to drought-stricken properties hundreds of kilometres away. The campaign ended up lasting for the whole the cane season, culminating at Christmas. Anne suggested gathering Christmas presents and food hampers to deliver with the hay and the Food for Farmers appeal was born. Anne still organises the hampers each Christmas whenever there is severe drought in western New South Wales. A highway action protest against CSG is in the planning stages when we meet, and Anne has just returned from the police station where she has been discussing the legalities of organizing such an event. What began as an idea in western NSW had quickly spread throughout the state on social media and by word of mouth when Anne and others decided to get involved. “I ran with it and people just wanted to jump on board”, she says. On the day of the event, activists cover around 2,800 kilometres of road in a peaceful and public show of opposition to CSG, the largest highway action to date.